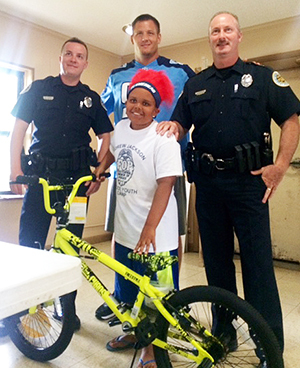 Defensive lineman Karl Klug visits police camp for underprivileged children. NASHVILLE, Tenn. — Titans defensive lineman Karl Klug made a special appearance at the Andrew Jackson Lodge of the Fraternal Order of Police local youth camp on Saturday, encouraging underprivileged children to surround themselves with the right people, and work hard to create opportunities to be successful. The Andrew Jackson Police Youth Camp hosts 300 adolescents, ranging from ages eight to 12, in weeklong camp sessions at a facility in Mt. Juliet for six weeks during the summer. The camp is funded strictly on donations, and administered by volunteer police officers, active and retired alike, where they interact with campers in a fun, upbeat environment. “Our children are referred to our youth camp by the police officers who work in their neighborhoods and know the children to be deserving, but financially unable to otherwise attend summer camp,” Herald added. The schedule for campers included activities such as canoeing, fishing, swimming, kickball, a boat ride on the lake and more. “My favorite part was swimming and the hayride,” 8-year-old camper Joshua Poindexter said. During his visit, Klug also expressed his gratitude to the metropolitan police force, reiterating to the children that police officers are always there to help. Each camper received a bag full of Titans gear, an autographed item, and a high five from Klug. “It was awesome having a Titans player come out today, because I’ve never seen an actual NFL player,” 11-year-old Nathan Kirsch said. Klug hopes to return to the camp again next summer. To learn more about the Andrew Jackson Police Youth Camp or to donate, click here.